A discouraging opinion, a war, and growing a family puts dating the skull on hold. 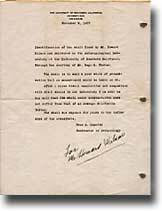 In 1937, Howard received a letter from Dr. A.O. 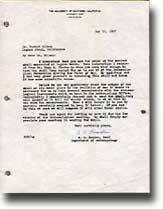 Bowden, head of the Department of Anthropology at the University of California requesting to see the skull. Howard packed it well, and sent it off to the University, excited to know that the most respected scientists in Californian Indian studies would be weighing in with their opinion. "After close visual examination and comparison with other skulls in our laboratory, I am able to say only that the skull under consideration does not differ from that of an average California Indian. The Skull was exposed for years to the influence of the atmosphere". Of course, the fact that the skull was found five feet underground encased in solid rock didn't seem to influence this studied opinion at all. But how could the skull have been exposed to the atmosphere for years?, thought Howard. It seemed impossible to him. He remembered thinking at the time that maybe the skull had been exposed to the atmosphere for years before it became buried so deep in the ground, but that would make it even greater in age then he or anyone else thought possible, so he dismissed the thought himself. The letter was very discouraging to Howard. Lacking any positive scientific method with the technology of that time to positively date the skull left him with little choice but to accept the opinion of those of greater knowledge. If they said it was nothing special, then he must accept that opinion. But, it was difficult to accept when the opinion didn't seem to fit with the facts. Howard put the skull back in it's little box and back on the shelf in his closet, and there it stayed. Howard soon went off to war in the Pacific, returned home to begin raising a family and grow his Building Design profession. It would be almost another 20 years till the skull came back out into the light of scientific inquiry.